If you’ve ever felt afraid that you’re ruining your kids, or you’re worried they won’t learn what they need to know or they won’t be prepared for life, then take a step back and let me help you get off that crazy-train. As a homeschool graduate who’s homeschooled my own children for a decade, I’m going to help you relax a bit so you can actually enjoy this time with your kids and rest in knowing that God is bigger than your chaotic day. There are realistic ways for you to streamline your schedule without compromising value. Give me one hour and I’ll offer you peace and clear direction as I teach you how to simplify your daily routine, maximize the most important lessons, and minimize the inconsequential. Simplify Your Homeschool Routine will help you discern your priorities so you’ll feel confident in knowing that, with God’s help, you’re raising kids who can become emotionally healthy, well-rounded adults who are prepared for life and for the spiritual battle Ephesians 6:10-20 warns us about. I know that when my own children are grown, there will be things 20/20 hindsight will help me realize I should have done differently. But I already to know with complete certainty that I don’t want my children to leave home feeling unprepared or under-loved. I don’t want to have the regret of knowing I focused on unimportant things or missed great opportunities to train them and connect with their hearts. I’m sure that’s what you want, too. And by the end of our time together, you’ll be able to have more direction, deeper peace, and better confidence about your ability to provide what your kids need in the time you have available to work with them. A bonus resource page FULL of helpful links, articles, products, and more ideas to help you simplify your own day (many of the resources are FREE!). An invitation to email me with specific questions about your own unique schedule! Practical, realistic suggestions that you can begin implementing immediately into your home. Unique perspective from a 2nd generation homeschooler. What will matter once the kids reach adulthood? What’s a waste of time? As a homeschool graduate who’s homeschooled my own children for a decade, I’ll help you figure it out! Fluff. Homeschool moms are busy, so there is no filler content. This masterclass is very straightforward and to the point! Mandatory homework. 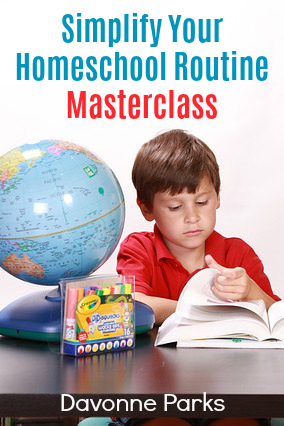 Simplify Your Homeschool Routine was designed to help you simplify your homeschool lifestyle, not to make you busier. So, any of the very simple application suggestions are 100% optional. Visual aids. Do not feel like you have to sit still and watch me talk to you – if you want to, that’s great! But if you just don’t have any time to spare, simply let the videos play while you fold laundry or chop vegetables, and you won’t miss a thing! Advice you’ve heard a hundred times before. Yes, I’ll probably talk about a few things you’re already familiar with, but I know from speaking with so many women that some of the ideas I’ve learned through hard-fought struggles are revolutionary even to veteran homeschool moms. Plus, if you’re dissatisfied with the masterclass content, email me within 14 days, and I’ll give you 100% of your money back! So what are you waiting for? !